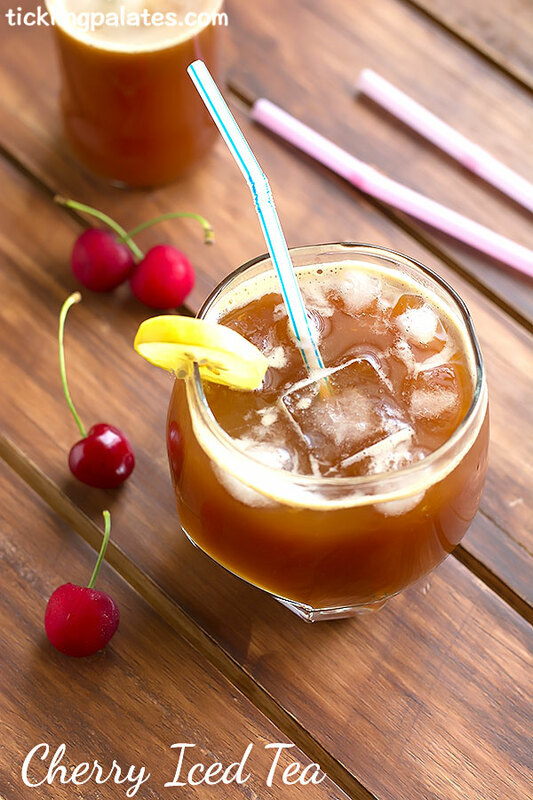 Cherry Iced Tea Recipe. A perfect recipe to make using those tart cherries during the cherry season and to help you blow the heat that’s beating down. A fruity iced tea is a perfect beverage for Summer. If you happen to love iced tea like me, then I’m sure you will love this drink. Its a crime not to have a pitcher of iced tea sitting in the refrigerator when the temperature is hitting 40 deg C.
There is a reason why its called Iced Tea. Drinking fruit teas that is at room temperature tastes so blah. There can be no worse punishment than that especially during summer. As you can control the level of sugar that goes into the iced tea, homemade iced teas are obviously better for you than the bottled iced teas that you filch off the shop aisles that are not only full of artificial flavors but also happen to be high in sugar. 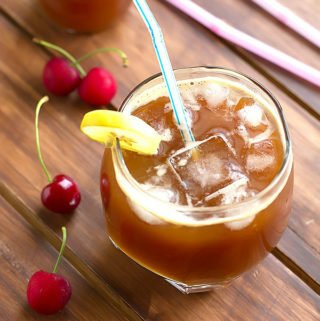 I have macerated the cherries to make this cherry iced tea. Maceration softens the fruit and brings out the juice which not only reduces the tartness of the cherries but also it tastes better. 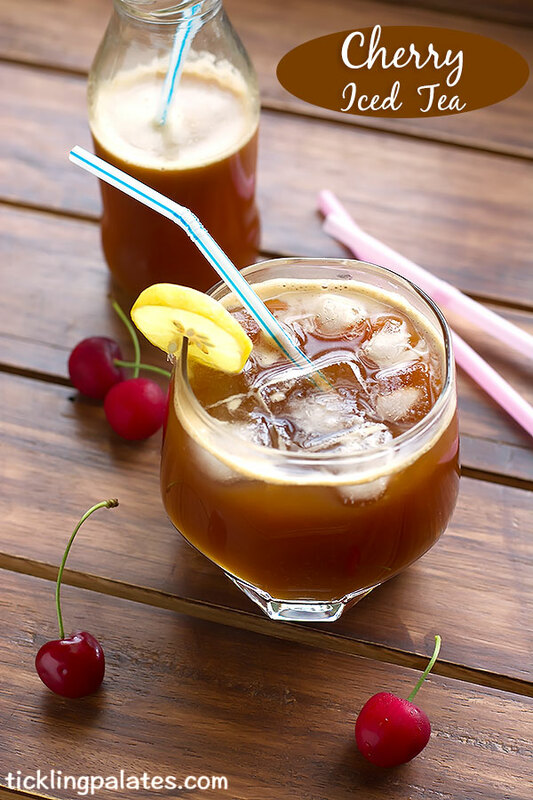 You can save the cherry syrup in the refrigerator for 3-4 days and make this iced tea whenever you want in a jiffy. The cherry iced tea itself can be refrigerated for 2 to 3 days and can be drunk whenever you want like you would drink any fruit beverage. You can also try out the following fruit beverages that can help you keep your cool this summer. 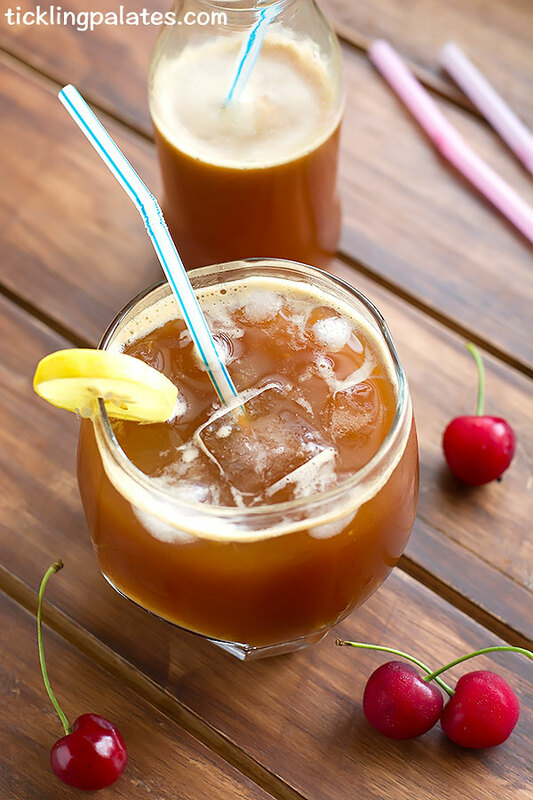 Cherry Iced Tea Recipe that is perfect summer beverage to beat the heat. Wash, pit and remove the stem from cherries. Place cherries along with sugar and mash roughly using a fork. Set it aside for 30 mins. This makes the fruit to soften and bring out the juices from it. After 30 mins, the sugar would have completely dissolved. Tip the entire fruit, juice and all into a blender. Add 1/4 water and blend till smooth. Pass through a sieve to remove the skins. Refrigerate the syrup till serving. Bring 2 cups water to a boil. Add tea leaves and let it simmer for 2 to 3 mins. Switch off, close with a lid and let the steep for 10 mins. Pass through a sieve and discard tea leaves. Keep the brewed tea aside and let it cool. In a pitcher, add cherry syrup, brewed tea, sweetener of your choice, lemon juice, stir well and refrigerate. Fill the serving glasses half with ice cubes. Pour the prepared tea over the ice cubes. Serve Cherry Iced Tea garnished with mint leaves and lemon rinds. I tried this “Cherry Iced Tea” in my house. Its very tasty and my family members also like this dish.